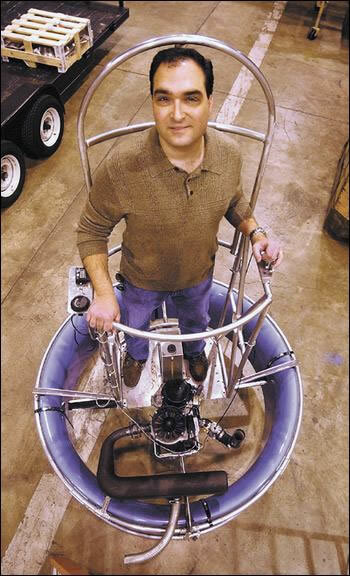 The VertiPod from Air Buoyant is essentially a one-person helicopter - turned upside down. The pilot stands above the propeller, braced against a back support. Steering is simple - just start leaning in the direction you want to go. More than a mere ground-effect vehicle, like a hovercraft, the VertiPod can fly up to fifteen feet above the ground at speeds of up to 40 miles per hour. The thrust comes from a 440-cubic-centimeter engine that runs on gasoline or ethanol and can be activated with a pull-start, like a lawnmower. "They were half way home when a single flyer, hopping free in a copter harness, approached the little parade... John Thomas thought that he recognized that he recognized Betty's slapdash style even before he could make out features." Readers might also think of the two-man hover pods from the 1960's cartoon Jonny Quest. 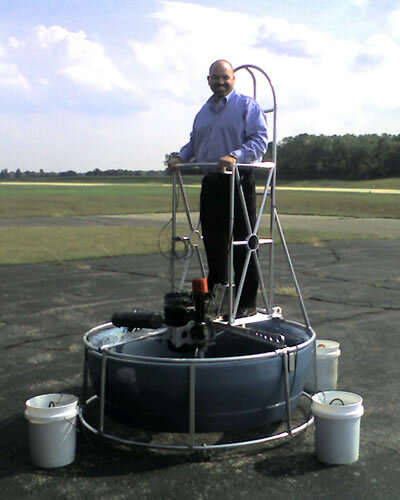 Read more about it at Wired and at the Air Buoyant VertiPod website.